After the Civil War in the US, there was a saying that Abe Lincoln may have freed all men, but Sam Colt made them equal. A similar thought occurred to me regarding Kilgray when I began testing the new memoQ cloud service announced last month. This convenient, no-hassle "server on tap" really has the potential to level the field between teams of individual translators and agencies with servers. Kilgray will hold a free webinar on January 22, 2014 for setting up and using the memoQ cloud service. I will also be creating some resources (blog posts, videos, additions to future editions of my memoQ user guide) to share my ideas for how to work effectively with this platform. At a cost of only €120/month for a project manager license, this is a very cost-effective way for teams to access server functions as needed without the heavy investment and risks of setting up and maintaining their own local server. It also promises to be a good alternative for small agencies or corporate departments with limited capital budgets or limited abilities to maintain infrastructure. The memoQ cloud service currently requires the use of memoQ 2013 R2. Attempts to access the server for administration with an older version of memoQ will result in error messages or a notice of the version needed. If you are curious about working with a memoQ server, you can try the service for a month with only $1/€1 charged to your credit card. There is a bit of a learning curve for setting up projects correctly for various purposes, and I expect some users may have difficulties putting together pieces of that puzzle from the various memoQ Server manuals from Kilgray, but I expect that before long there will be a number of useful guidelines for different audiences. Data on the memoQ cloud server are saved for up to three months of a "dormant" period, and if a subscription is to remain inactive for a longer period, a full backup (including all user data and projects) can be made and restored later. Working with a server requires some different strategies than desktop-based work, and I think it will be important to emphasize some of these differences so that project mangers in the teams will understand what can be changed or added after a project is launched and what cannot as well as what alternative approaches are available. Adding a LiveDocs corpus on the server to a project is one such case. Translators working with memoQ cloud or any other memoQ 2013 R2 server may also be a little disoriented by changes required in their revision workflows. If a bilingual file of some kind is exported for external review in a server project, it must be re-imported in the server project management window for the project by someone with corresponding rights. 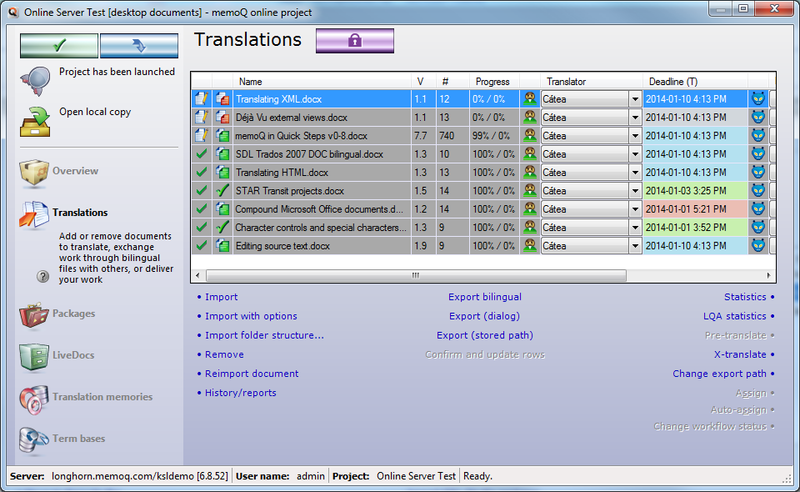 The new monolingual option for importing reviewed documents may provide a practical way to revise text externally in some cases and re-import the changes to the project, but this new feature is not trouble-free in all cases and thus should be used with great care. On the whole, I am extremely encouraged that Kilgray has offered this new service. I have been asking for something very much like this for nearly five years, and what's on offer here greatly exceeds my expectations. I have a few questions about administrative details which I need to ask Kilgray, but from a technical standpoint I really see this as a best case for the company's software as a service. Anything that can facilitate (small) groups of independent translator to work together on appropriate projects is generally welcomed. The main obstacle with servers configurations was and remains technical - having the required hardware, configuring it, and maintaining the server is not trivial; this is not to say that there aren't independent translators that can do it, but I think that it is relatively safe to say that this is not what an average user can do. I just wonder what will follow. Will this be refined into a primarly collaborative type of platform, or with time turn into a Project Management System to compete with XTM, WordBee, etc. Well, Shai, as a "start" it's well beyond what I've seen from a few other hosted solutions. That actually doesn't matter so much in most cases in my opinion; the productivity gains I personally experienced in a small team simply by attaching a shared TM and termbase were so significant that everything on top of that actually feels incremental. But this is a rather "deep" solution, where rights and roles and many sophisticated options for configuration are available as needed. It can be about as simple as your usual use of memoQ or as complex as you need it to be. Not sure how to respond to your second question. How do you define a project management system? My guess is that where your definition includes features not found in the memoQ server, you'll find some of these already in evidence as features offered by Language Terminal (I don't talk about these much as I don't see this as particularly good direction for Kilgray to go - my looks inside OTM for the past four years have shown me how much effort can be needed to get this right, and I would rather this effort be focused on translation technology). For these and other "missing" features, there is an API to integrate with other tools. This is really the way to go. Many organizations have their own accounting and CRM systems in place, and it's better to interface with these than re-invent the wheel badly. memoQ (and its better competitors) do this already through their application programming interfaces, and I wouldn't want to see it any other way. What I wrote was not an attempt to criticize the hosted cloud service, quite the contrary. I don't think that there is any argument about the productivity and efficiency gain from sharing information among a workgroup. I called it a start because this is what it is for me. At least as far as I know, except for OmegaT (and specific workarounds and configurations) it is the first affordable solution from any of the "big" translation supporting technology developers and one that seems reliable, scalable, and honest enough to consider using. About my second question, I was just thinking loudly, wondering if this will be continued to be developed while focusing on the professional needs of a workgroup, or turn with time into another solution aimed to facilitate small agencies to setup shop and run their brokering business "on the cloud". On a larger scale I was also wondering, how other technology developers will react, because this solution could overlap some of the solutions currently offered by Kilgray's competitors. Nothing wrong with your choice of the word "start", which is literally true. A late start, really, but a good one that may develop in some interesting ways. Although I'm sure there will some low-overhead brokering activity that uses this, the same sort of thing is possible with competitive solutions out there, and it simply hasn't happened in a noticeable way, or I haven't seen it, because I keep other company. My guess is that this service will probably make it easier to do more of the same business Kilgray does now, with lower barriers. An agency or company department can be "ready to run" or test in about 20 minutes without worrying about hardware or an IT department. More effort can be focused on learning the application workflows and possibilities before a major investment is made. Although I see this as the ultimate leveling tool for freelance teams, it remains to be seen how many will plan for the use of this tool and be ready with the knowledge needed when project opportunities arise. There may be a long incubation period for this.